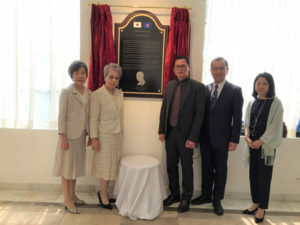 Not many know that the Fukuda Doctrine marker unveiled at the Manila Hotel last Oct. 1, 2018 was designed by Dr. Marloe B. Sundo, the Director of the University Planning and Maintenance Office of UPLB and our current 1st VP, at the suggestion and initiative of UPLB Chancellor Fernando C. Sanchez Jr., a former chapter head of PHILAJAMES-SLC. The two gentlemen presented three initial designs of a stone monument to Amb. Francis Laurel, the Philippines-Japan Society president, and to Dr. Philip Sanvictores, then PHILFEJA President, on Aug. 29, 2017. 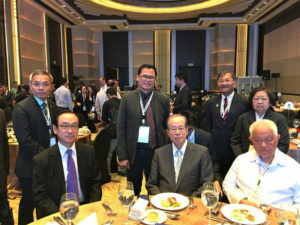 Dr. Sanvictores later presented the designs to former Prime Minister Yasuo Fukuda, the eldest son of former Prime Minister Takeo Fukuda, during the ASCOJA conference held in Brunei on September 8 to 10. 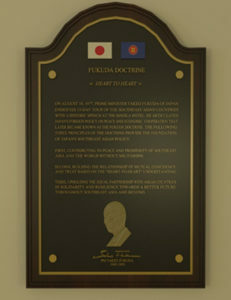 The Final Design of the Fukuda Doctrine Marker. In January of 2018 it was decided that the monument would be best located at the Manila Hotel as a pedestal with inscriptions. 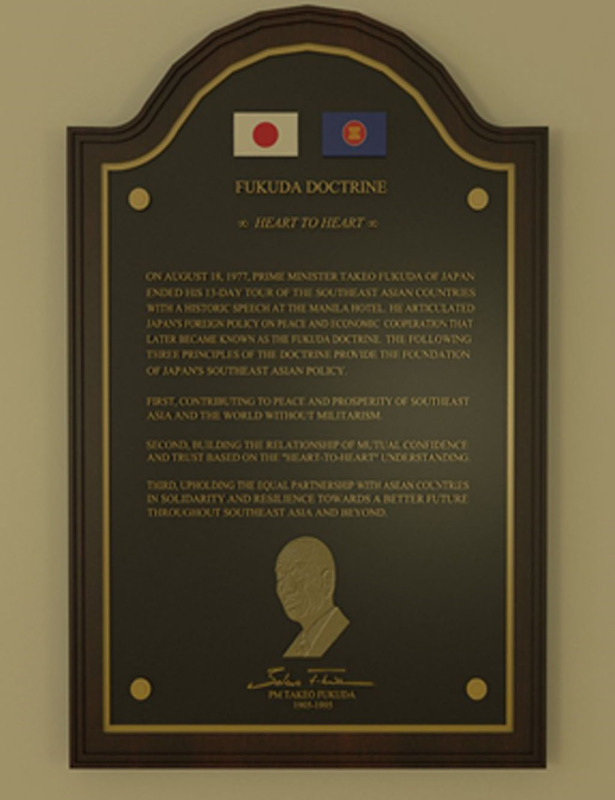 It was at the hotel where, in 1977, PM Takeo Fukuda articulated Japan’s foreign policy that later became known as the Fukuda Doctrine. The pedestal was further revised into a hanging marker after the Manila Hotel Execom decided it was best displayed on a wall of its Heritage Hall. Finally, thanks to the help of Mr. Emmanuel Carbungco, a drafting aide at UPLB’s Planning and Maintenance Office, the final rendering of the marker was completed. 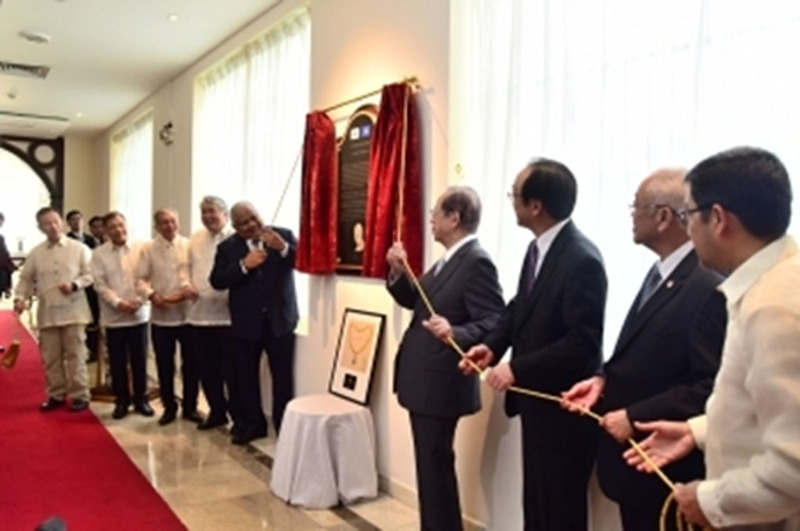 Unveiling of the Fukuda Doctrine Marker at its temporary location outside the Heritage Hall of the Manila Hotel. 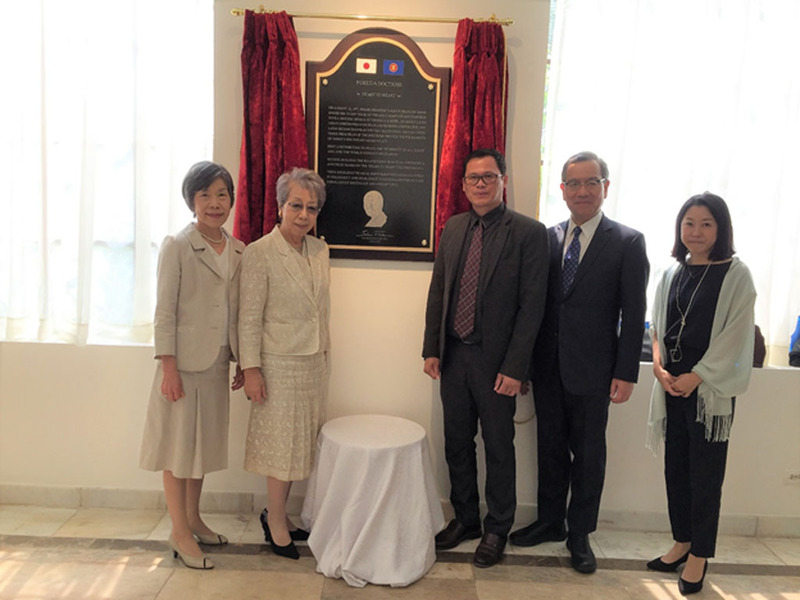 Dr. Marloe B. Sundo (center) with two daughters, a grandchild and a great grandchild of the late Prime Minister Takeo Fukuda. 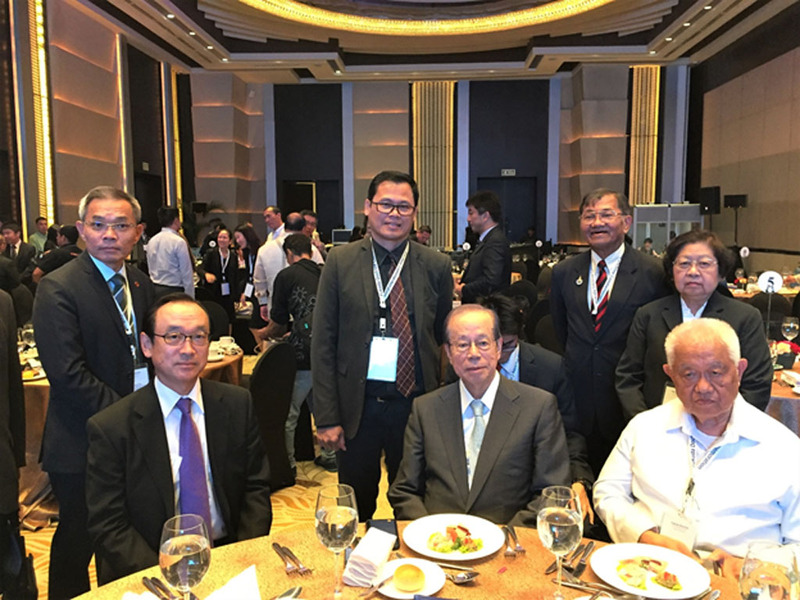 Former Prime Minster Yasuo Fukuda (seated, center), with Ambassador Koji Haneda to his right, former Prime Minister Cesar Virata to his left, and Dr. Sundo standing behind him.